Composite doors offer superb energy efficiency, high security and stunning looks. Discover more reasons to choose a composite door for your home. Why Choose Composite for your front or back door? The doors themselves are Composite doors of the highest quality which are factory manufactured to stringent quality control criteria and will comprise of a reinforced PVCu outer frame. They will have either a solid thermally insulated polyurethane foam core slab or from our Premium range a solid engineered timber core slab. All our composite doors are made to measure to your specification. Composite doors have a high dent resistance. They will not warp, twist or bow see our Terms and Conditions for prevention. Most of our Composite doors have solid coloured skins with some having painted finishes. Each door comes with a full 10 year manufacturers guarantee. 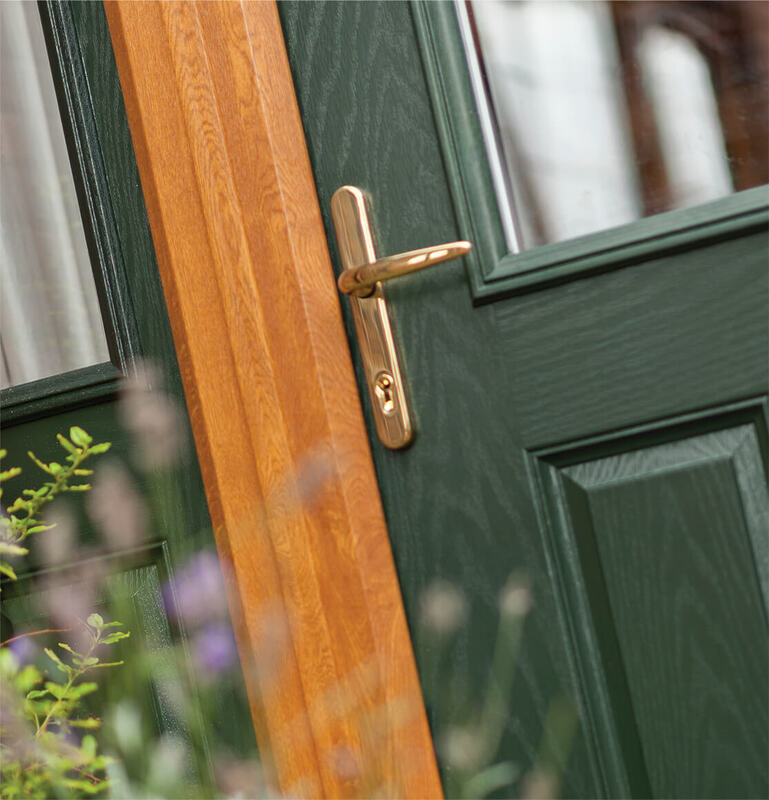 A composite front door has superb heat insulation qualities (6 times that of timber). Our solid unglazed door achieves a ‘U’ value of 0.37 and our half glazed door achieves a ‘U’ value of 1.39. These low numbers mean you save money on heating bills and also help reduce your carbon footprint. There are currently 27 composite door styles on our designer to choose from, with a large range of glass designs and backing glass designs to suit. We offer traditional, cottage and modern composite door designs, so your new door can perfectly complement your home. To view the full range of composite door styles and glazing available, simply visit the composite door styles pages or design a door on our composite door designer. Each of our doors has an attractive wood grain finish. Available in 13 colours: White, Black, Cream, Red, Green, Blue, Grey, Black/Brown, Chartwell Green, Duck Egg Blue, Poppy Red, Light Oak or Dark Wood. Each door has a white interior to ensure a light hallway, although Light Oak and Dark Wood come with the option of interior colour if you prefer. 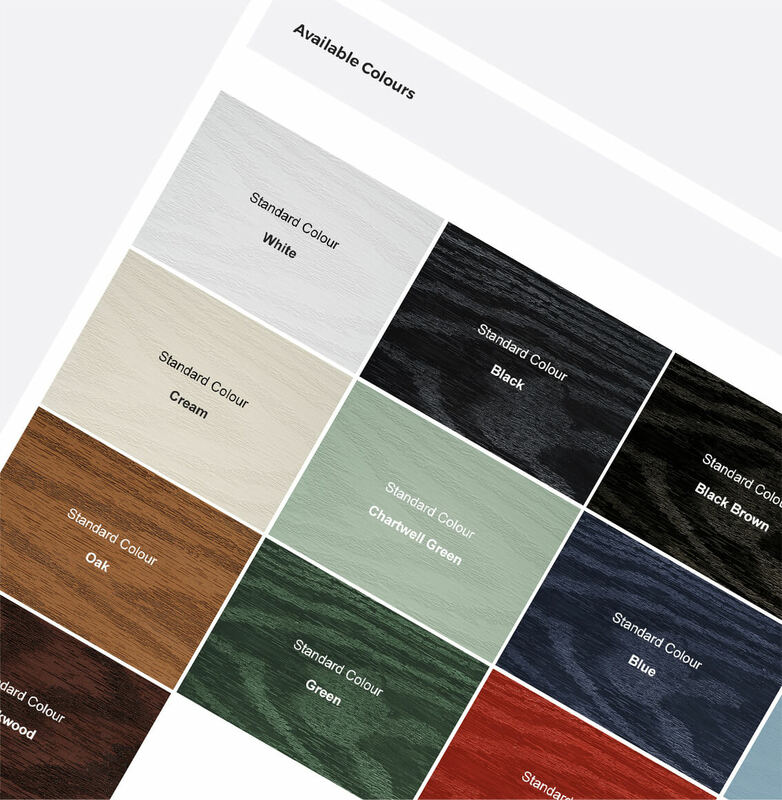 There are 9 composite door frame colours to choose from: White, Golden Oak, Mahogany, Cherrywood, Whitegrain, Black/Brown, Chartwell Green, Cream or Grey. All frames are supplied white internally as standard, however Golden Oak, Cherrywood & Mahogany are available internally if required. 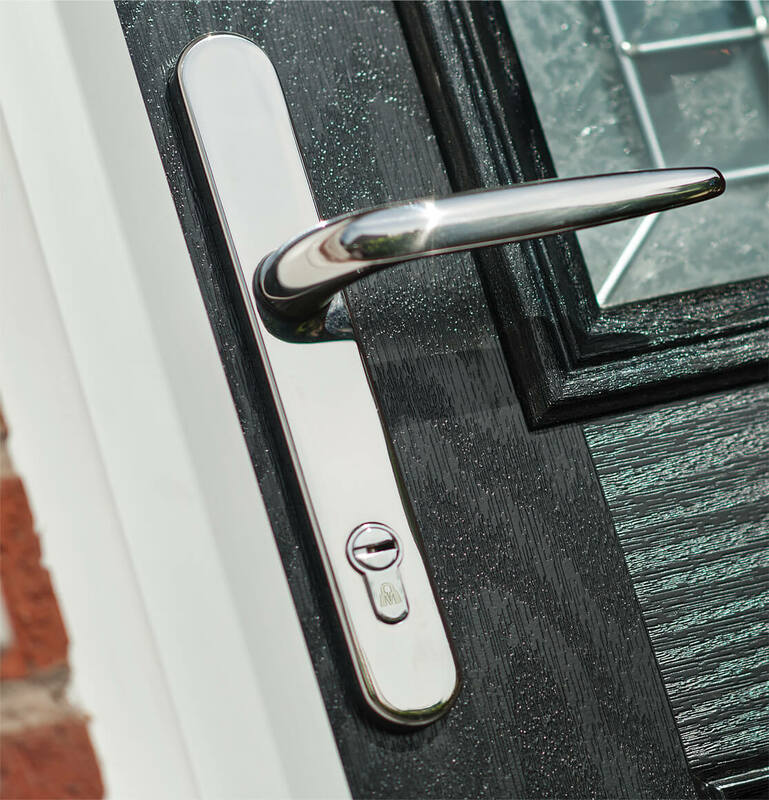 Each composite door comes with a choice of high quality door hardware in Gold, Polished Chrome Silver, White, Graphite Satin Silver or black finishes. Our latest range of hardware includes square handles, long bars, ingot knockers and oval & square escutcheons. To browse the full range, use our composite door designer & click on the second step to add hardware. 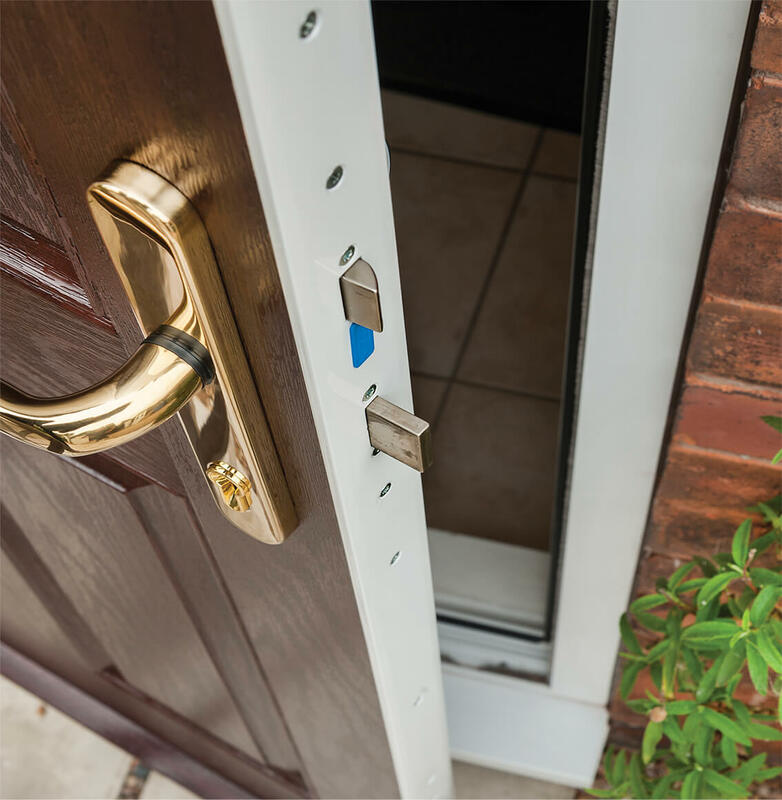 Find out more about the different function options of our composite door handles. By having the Security Upgrade a much higher level of force resistance can be achieved than that of standard security. A Security Upgrade helps to reduce crime by raising the standards of security features. CompositeDoorShop doors come with a Yale Door multi-point locking system and 6 pin cylinder as standard. 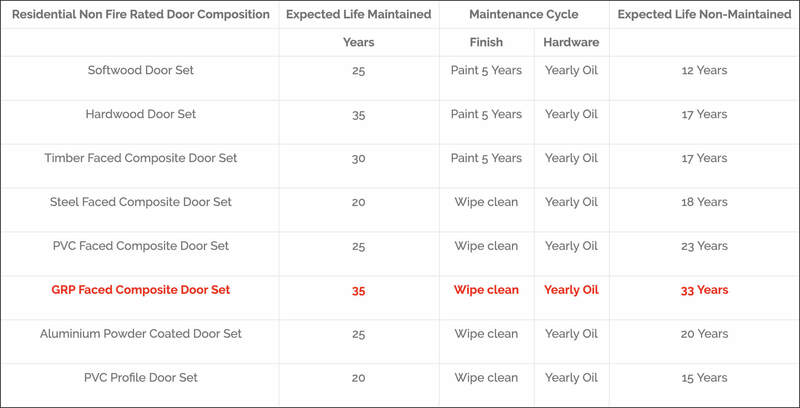 NOTE: Life Cycle and maintenance data from HAPM and BRE Life Analysis overall building life impact report. All CompositeDoorShop doors are supplied with Quality hardware including Fab’n’Fix and Yale. This long-lasting hardware has passed tests with superior results in damage resistance and longevity. Not only is the composite door hardware long lasting, it is also attractive and ergonomic.